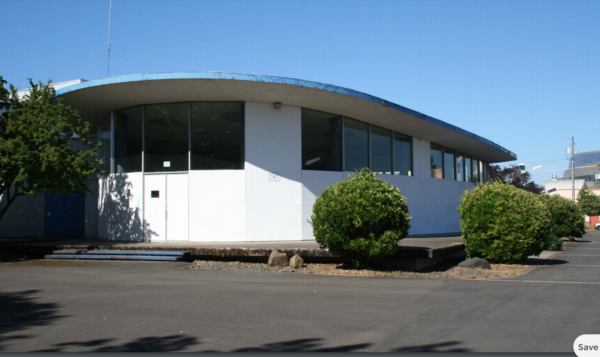 Members of the campus and community can learn more about the University of Oregon’s proposed redevelopment of the former Joe Romania car dealership on Franklin Boulevard at an open house at 4 p.m. April 5. No, I’m not talking about the historically ugly money pit that is Collier House. Around the O has a speculative rendering of the new plan to redevelop the fabulous Lew Williams car showroom and the Romania lot. Looks pretty good to me. And some money for the academic side to boot. Photos and much more in the National Park Service report granting the building historic landmark status here. My first experience with this exemplar of Googie architecture was in 1995, when as a newly hired assistant professor I was shown my office in PLC. I asked if it might be possible for me to have a desk and a chair. The department manager told me to go down to the “Old Romania Lot” and pick out whatever I wanted from the surplus pile in the back. I’m still using that desk. UO would like to generate some money from this property. Would that we could do the same with Knight Arena. Last year we got city permission to use it for Matt Court parking, but lets face it – nobody wants to watch Dana Altman coach basketball. Tagged campus plan. Bookmark the permalink. 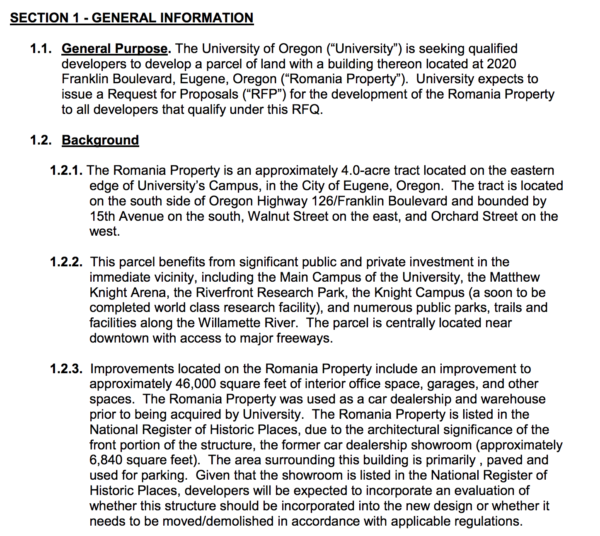 The Romania property came on the market back around 2005, and John Moseley, in his real estate baron phase, thought that the UO might need it for expansion at some point, and wanted to buy it. But the Foundation didn’t have the cash available to pick it up – having just forked out for the Williams Bakery site where the Arena was to be built – so Moseley went looking for cash elsewhere. It was decided that the Westmoreland student housing complex, with over 400 (mainly two-bedroom) units, was an “underperforming asset”, and so it was to be sold to pay for the more strategic Romania property. The UO Senate unanimously opposed the sale, citing many likely negative consequences, and the argument raged on for a year, culminating in a second Senate vote against the project in May, 2006. But in the end Westmoreland was sold for around $20 million, and the proceeds paid for Romania. Product Design students were housed there for a while, and various low-level maintenance operations, but it was clearly always just waiting for redevelopment. That is, until the Campus Framework Vision plan of a few years ago determined that, even if the university grew to 35,000 students, this property still wouldn’t be needed. (The big change in how this growth was to be accommodated was that the new plan for the Knight Campus and other science buildings placed more growth north of Franklin than had previously been envisioned). So now the term “underperforming asset” can be applied again, and people are looking at options for this property. I had always assumed it would be mixed-use, with commercial tenants and parking on the ground level and student housing above, and it may indeed turn out that way. But with its commitment to the Knight Campus and other large projects, the university doesn’t have the cash (nor probably the bonding capacity) to develop this, and the RFQ is a way to solicit ideas on how to use the property to generate income, while still hoping to hold on to the land to hedge our bets. The wildcard of course is the fabulous showroom – historically and stylistically important, and probably re-usable for something like a cool restaurant, but placed where it renders a lot of the site around it hard to use. Some of my students looked at it as the centerpiece of the Walnut Street Node 13 years ago, and showed that preserving the showroom may require designs that may be unconventional, but aren’t impossible. I think we should just sell off all the old desks, and see if we can swap the property back for the Westmoreland project – we could probably use another 400 units of affordable student housing. Why doesn’t it just become a showroom for the many exotic sports cars some of our students seem to be driving? Comment of the week for that “seem to be” driving bit. I have always been amazed at what little respect Eugene has for its historic buildings. Disregard for the past probably pre-dates the 1950s and 1960s, but during this period one beautiful building after another was torn down in downtown. Sadly, the buildings that replaced them are stark, ugly, and uninviting. This is an unappreciated reason for the decline of downtown. The thing is hideous, and the worst part of the proposal. If I formed my views about historic preservation using the same logic as UO Matters and the UO use re: Collier House, I would be jumping up and down to demolish the Romania monster in favor of housing or a parking garage or a new administrative building. But I actually care about historic preservation, not just celebrating when others make short-sighted decisions that validate my aesthetic biases. 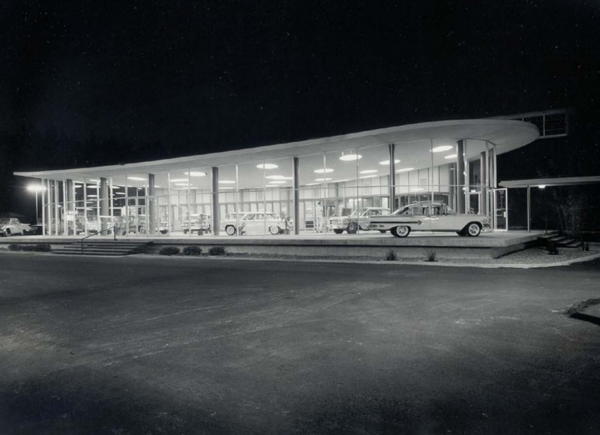 Despite the deceptive romantically-lit photo, the Romania building was never pretty when it was an active dealership. It was an eyesore. In the 70s I can’t remember how many people commented to me about the terrible first impression of Eugene it conveyed, along with other car-oriented commercial suburbanism and the lack of trees or good buildings along Franklin. It flew in the face of the notion that Eugeneans were ecologically-minded. The dealership was just a mess of ugly cars in a parking lot with a tiny, cheap, crappy, lifeless ‘swooshy’ display case in the middle, where car dealers sold unnecessary gas guzzling deathmobiles. The idea that it could be considered important — while Hayward Field and many beautiful houses (including Collier House, especially in its current setting) are considered disposable — just shows how far people are from understanding which architecture prioritizes people and nature. We agree with Monsieur Contraire. This building is a modern carbuncle that must be excised and replaced with something more befitting Oregon’s history as a former crown possession. Something classic, with a few fine corinthian columns would do. Although it must be said that the roof would be an excellent place to grow some organic kale, a very wholesome vegetable, which the local population could harvest for sustenance during their Sunday outings. The Romania building is a treasure of mid-century design. I’m excited to see it shined up and put on display. Are there any academic purposes that the building would naturally lend itself to? With all that glass it would be a natural place to put the Office of Public Records and the University Archives. We do have those records available in our showroom, but it’s $150 to get through the door. Perhaps I’m naive (and I didn’t see the Emerald article), but I would assume that any land-locked university would acquire as much nearby land as possible for long-term expansion. The fact that it currently happens to have family housing on it is generally irrelevant, aside perhaps for its PR value in hiding the ultimate intent. Perhaps it would actually be advantageous if it were condemned.